Working with Foreign Languages using MySQL and PHP. I received many tutorial requests from my readers that asked to me how to display and store foreign/regional language UTF-8 data into MySQL database using PHP code. This post explains you to solve Unicode data problems, just there steps you should follow take a quick look at this post. Sample database articles table columns id, title and description. Character set should be UTF-8 format. Insert - Why prefix 'N'? SQL insert statement. Here the N stands for National language character set. 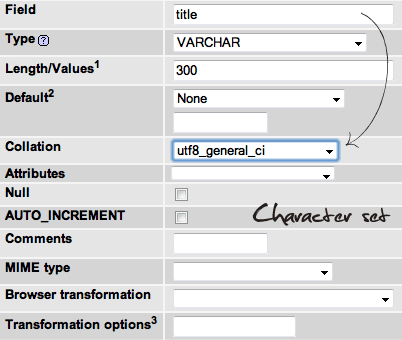 Which means that you are passing an NCHAR, NVARCHAR or NTEXT value Read more. You have to include this following tag in data results pages. Database Searching Techniques Regional Language. Contains PHP code displaying records form database. Before that you have to specify mysql_query() function data character set type. Hope this post helps your web project to reach global and regional(Indian languages). Thanks! Good post srinivas... thanks a lot. and as a final thing with utf8_general_ci you will not be able to see 'accent' differences and that might be major problem. gonna work on it soon! I am generating URL slugs for permalink purpose and if it's a foreign language it will be generated in that language separated by Dashes, it saves into the database fine, it also shows correctly upon normal select query but it Doesn't work in the WHERE clause. Hey thanks. This is helpful. Every once in awhile I waste time on character encoding problems. One question though: I'm assuming you only have to set character_set_results='utf8'" once for each mysql connection? i.e. you don't have to set it before each query right? Is there any way that, I can sort records of Gujarati alphabets like kakkavari.? You just solve my big problem. Hi Srinivas i want get regional language data from mysql database using soap web service without mysql query.if you have idea please help me.thanks in advance. I am new to php I have understand the concept, in my website i have created a list box of all the languages, but i don't know how to translate my english content to chinese or to spanish basically i need a translation code of a particular language. Thanks my issue is fixed.